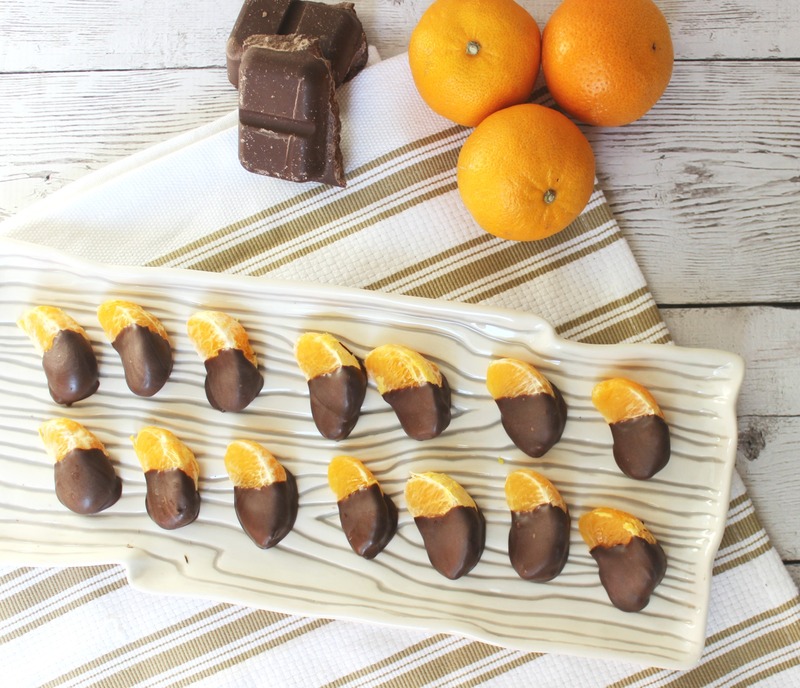 Chocolate Dipped Mandarin Orange Slices are a sweet snack idea! My boys come off the bus starving. Every. Single. Day. If I didn’t know better, I would swear they didn’t eat lunch. So like a good mom, I always have a snack ready for them when they get off the bus. Sometimes their snack is something as simple as a pack of Goldfish crackers, but every now and then I like to get a little more creative with the snacks. 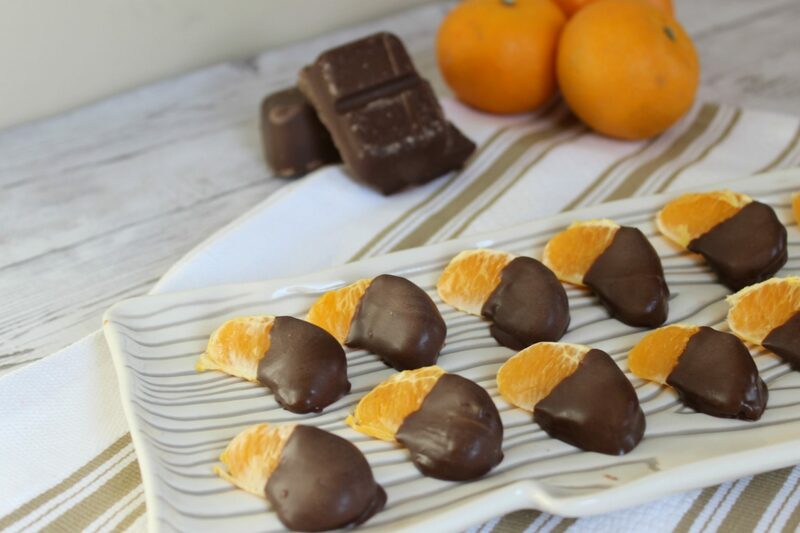 These Chocolate Dipped Mandarin Orange Slices are a perfect after-school snack because not only are they delicious, they are ready in almost no time. Plus, the kids love them. 1. Line a baking sheet with some parchment paper or a baking mat. 2. Peel your oranges and set them aside. 3. In a microwave-safe bowl add your chocolate chips and shortening. Melt chocolate chips until the chocolate is nice and smooth. I generally stir every 15-20 seconds and it takes a couple of minutes to melt the chocolate completely. 4. 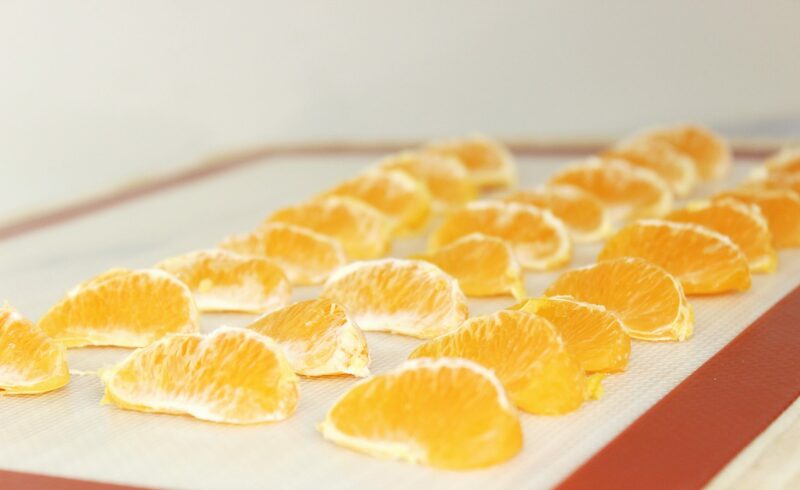 Dip each mandarin orange slices halfway into the melted chocolate and then place them on your parchment paper or baking mat. 5. Refrigerate your orange slices for about 10 minutes or until the chocolate hardens. That’s it. Simple as that! You can now enjoy your Chocolate Dipped Mandarin Orange Slices! It seriously doesn’t get any easier than that, guys. 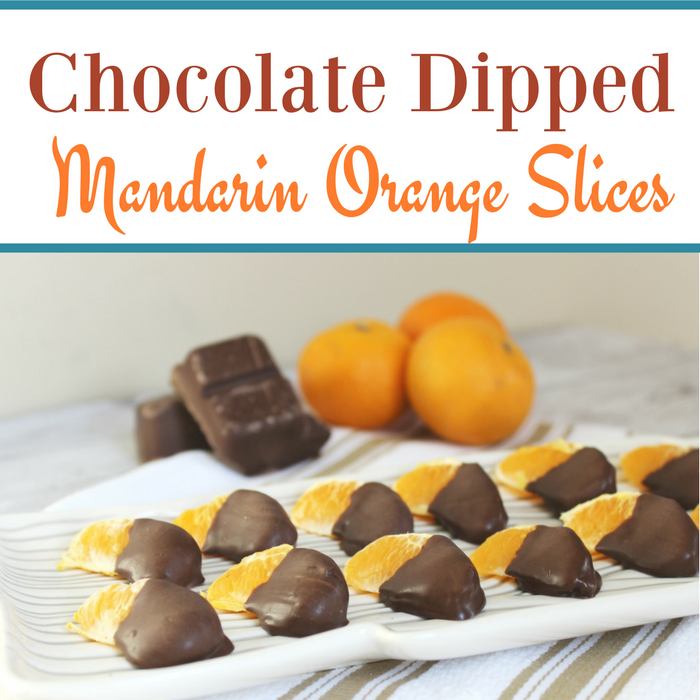 These Chocolate Dipped Mandarin Orange Slices are an easy snack to whip up for after school or even to bring to the next get-together you are invited to. They always go over BIG! 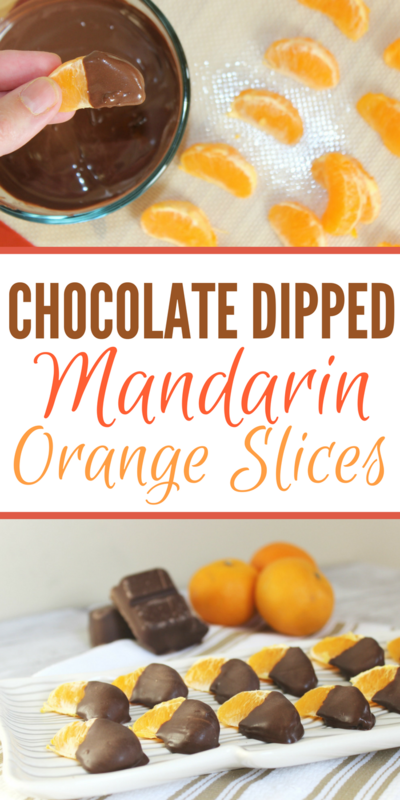 Have you ever had Chocolate Dipped Mandarin Orange Slices before? If not, I highly recommend them the next time you are in the mood for a sweet treat. Those look so good! I love chocolate covered anything, and this looks like a real winner. I can just taste all that sweetness! These look really good! I enjoy them myself with a little sea salt on top! This looks and sounds so delicious! My kids would love this as a treat! Thanks for sharing. This is such a great idea! Kids will surely enjoy these! What a fun and easy snack! The trouble is that I am probably going to eat them all before the kids get off the bus. I love all things chocolate. Delicious treats for everyone to enjoy! I like Mandarin oranges because of their natural sweetness. Dipping them in chocolate is an awesome idea! This was a great reminder of how easy and how delicious these are. The combination of chocolate and crates is wonderful. This would make a delicious snack! I’ll keep this in mind during summer break. My daughter is sometimes like, “I’m starving,” so I could make this. Or tell her to make it herself. I mean, she’s 11. Wow these look super yummy! I never thought of this combo but I bet it taste delicious! They look amazing! Perfect for mother’s day brunch! Thank you for sharing it! Fruit and chocolate pair so well together and this is such a simple, yet delicious bite! I think I have everything I need to make these. Yum! These look like something you’d find in a candy or chocolate shop. 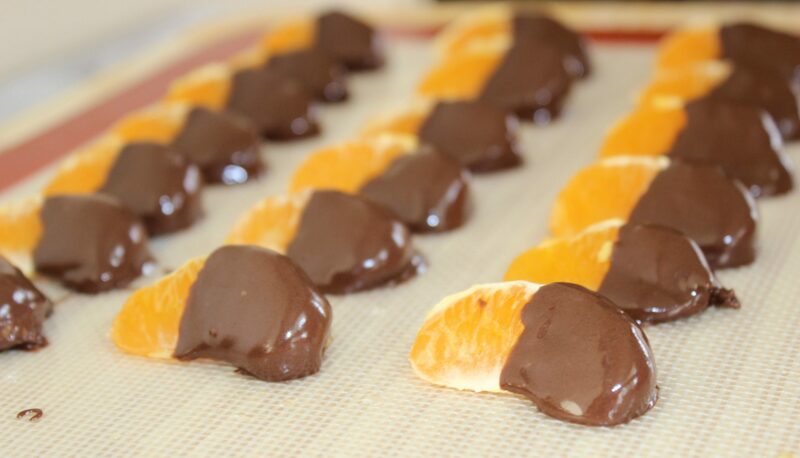 I haven’t had chocolate dipped oranges in a long time, these are nice and easy to make. These are two of my son’s favorite. I wonder if he would like the combination. I should try to find out. I love chocolate and I love oranges, but I am one of the few who don’t like the two together. However, I would totally make these and serve at a party! Once again you take a great treat make it from scratch and make it seem like anyone can do it. I know my son who is like your boys would love this after a hard day at school. I bet my kids would like this as an after school snack. I love chocolate and fruit. You make everything look so easy. This is definitely something my kiddo and they can do together and it looks like it will be very classy treat! Yum! I have the same struggle when it comes to after school snacks. My kids come home STARVING (their words not mine) so I try to have something ready for them to grab when they come in the door. Adding these to our rotation. Thank you! This is a little bit of nutrition and a little bit of indulgence. It does look tasty with the orange dipped in chocolates. I would love this. This looks so yummy! I could imagine that the flavor combination taste amazing. Looking forward to trying this recipe. These are super cute. I had no idea that one would even think to combine chocolate with mandarin oranges, very unique. Those look so good. Sometimes the easiest and simple are the best ways to go. Delicious and I am seriously motivated to make these. What a fantastic treat idea. 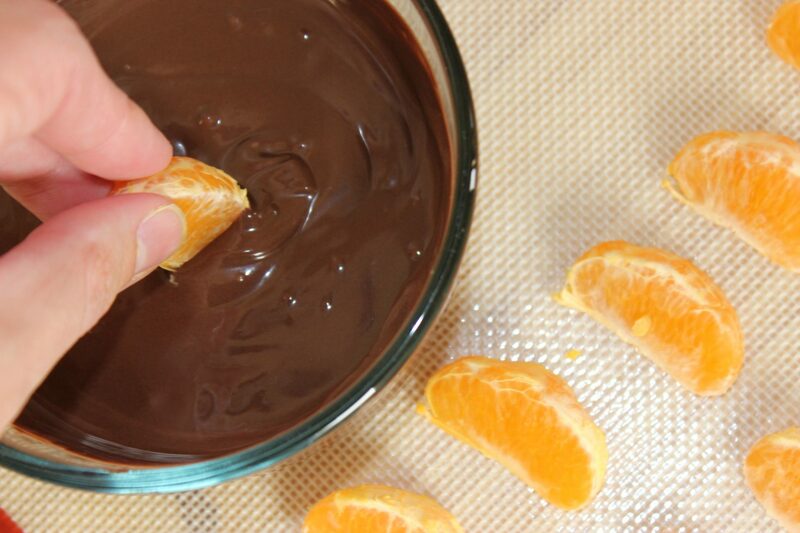 My kids would love these and get the best of both worlds: orange and chocolate. Delicious! I am not sure why I NEVER thought to make these before but you Robin, are brilliant! Oh my gosh, those look divine! What a delicious treat and pretty simple to make. I need to try it with my kids. We have 16 mandarin orange trees in our front yard 🙂 I will try this recipe soon. Look so good! I think this is a nice innovation. Orange slices with an exterior of chocolate sounds nice. Definitely, the flavours of chocolate and orange blending together must give an exotic taste. 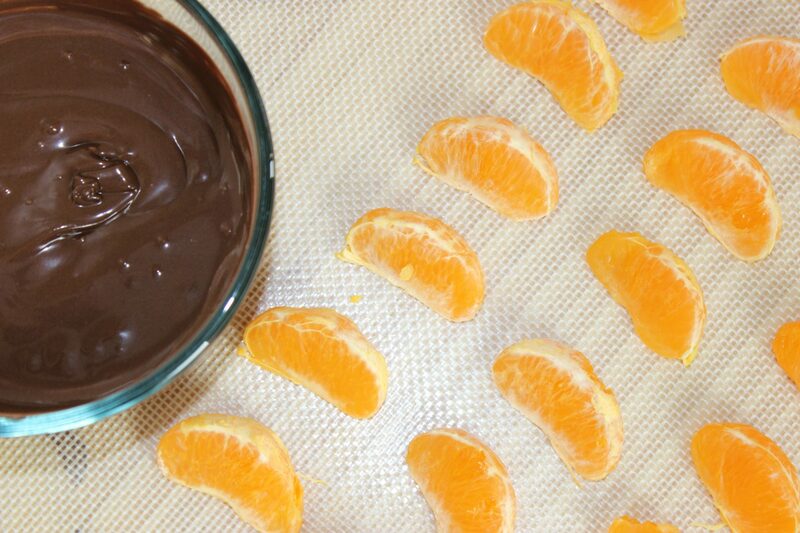 Those orange slices are so good what more if you dip them in yummy chocolate! This is definitely something that I don’t mind making as a treat for me and my husband! My 19 yoa son loves mandarin oranges. I’m going to make these soon for him. I think he’ll really like. Thanks for posting. Old Fashioned Macaroni Salad Griddling Isn’t Just Done Indoors Anymore!